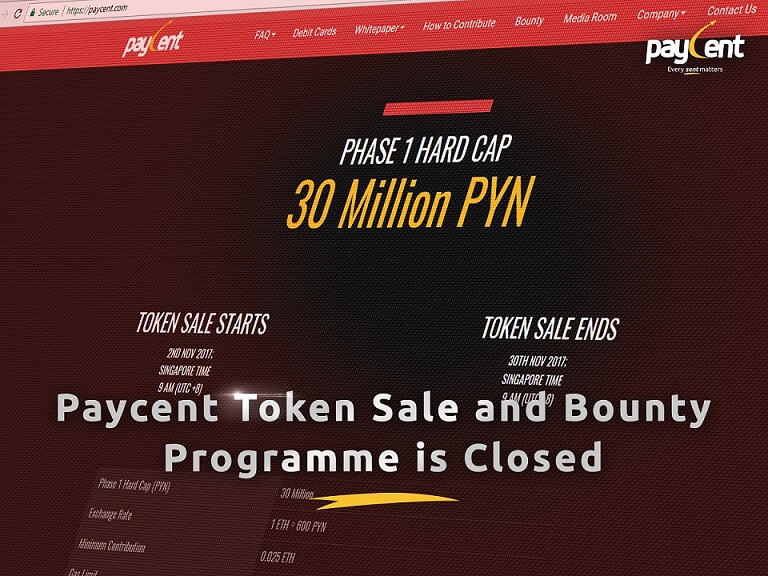 Paycent ICO Token Sale is officially closed! In line with this, the Bounty Programme has come to an end as well. Paycent ICO Phase 1 was a success achieved by a combination of crowdsale and private sale. Team Paycent thanks everyone for their faith, trust and support that have been bestowed upon us. We will continue the good work to carry the trust you’ve given us until we achieve what we have planned on our roadmap. The bounty programme has been a success because of you. You have been patient with us, and believed in our goals – to bridge the gap between digital asset and fiat. The distribution of PYN tokens for ICO contributors starts on December 2017. The distribution of PYN tokens for bounty participants begins on Q1 of 2018. We hope that you will be with us on our Paycent ICO Phase 2. Read our whitepaper for complete details about our Paycent ICO in phases. Please wait for our next announcements!